Happy weekend! I am happy to be off for a couple of days. Although, we did have a fun week at school. On Friday, we got together with our big buddies and dissected owl pellets. This is always fun for the firsties and the 6th graders. When the 6th graders were in first grade, they did it with their big buddies. The fun continued into the afternoon with a ‘wise owl’ project. I found this idea over at Artisan des Arts. Do you remember these (LOL, with technology they have been forgotten). First, you need to tear out a page for each child. Be sure to scan each page for inappropriate words. Next, I showed them how to draw the owl in pencil. Then, we traced over it with a black marker. After adding detail, they began to color them in with crayon. They used crayons and were told they did not have to be realistic colors. They could use bright colors. In hindsight, I would have them use oil pastels. I think the colors would have been more vibrant, but they still turned out great! Notice how this little one lines up her crayons. She does this every time. When she puts them away, she must line them up the same way in her pencil box. So I usually give her a little clean up warning before the others. 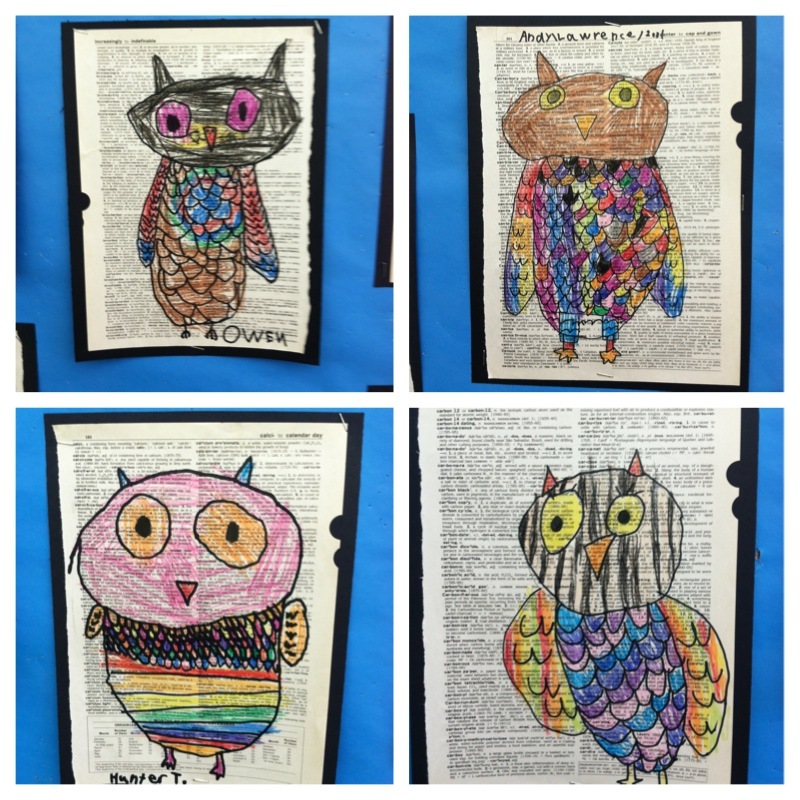 Here are some finished wise owls. I hope you enjoy your weekend. I have my school live/silent auction fundraiser this weekend. It’s always a lot of fun to see the parents out of their parent element.